A paper published in the British Journal of Occupational Therapy by researchers at London South Bank University (LSBU) and Brunel University London tested the effectiveness of an easy-to-understand measuring guideline leaflet to improve the chances of mobility aids being installed and used appropriately. With a lack of a national, standardised guideline on measuring for mobility aids, only 16 per cent of NHS trusts and social care services surveyed could reference some sort of guidance, which could be leading to financial and quality-of-life implications for the elderly. 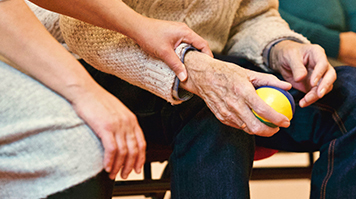 The research tested the way both occupational therapists and elderly people were able to accurately take the required measurements before and after receiving the guidance, with a rate of around 80 per cent of measurements taken adequately with the use of the leaflet. “Too many devices prescribed by health care professionals are abandoned due to them not being viewed as useful by service users,” she said. “Our research supports the principles of co-production, namely that service users need to be empowered to make decisions about their own health. “Service user groups have been vocal in acknowledging the importance of consultation and involvement. Read more about research conducted at LSBU.